9am - At the Wal*Mart, yesterday, a bunch of red clay pots were bought. Big ones, and medium size too. I've been busy this morning using some of those newly bought red clay pots. Re-potting from ceramic pots which feature an included dish. Those included dish pots do not drain correctly. That's bad for the flowers. The Tiny Waterfall side, on the right of the garden, is done. Only fine tuning to do for that side. In the pic below, you may see the left side. 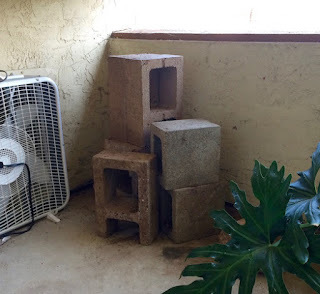 Some more concrete bricks may be needed over there. 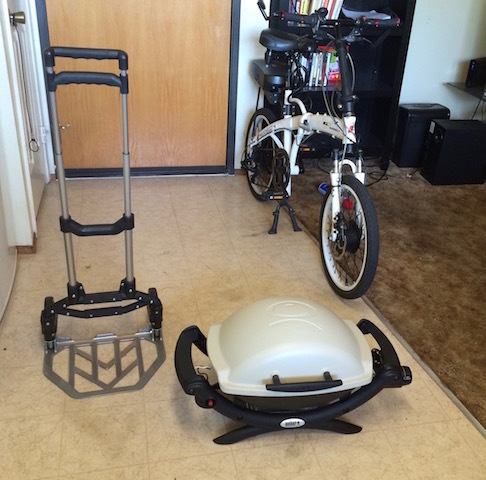 Yesterday I picked up the Weber 1Burner Q1000 Gas Grill that I bought from the Wal*Mart. Now I will be able to invite friends over to eat at the park with me! I bought the folding hand truck, that you see in the pic below, to help me move the Weber when I go to the park. I plan to attach a wood platform to the hand truck. The Weber will sit on the platform when I'm moving the grill. The first thing that I plan to do with my new Weber Grill is to take to the park and test it. Make sure that it gets hot. And grill a chicken breast to see how that works. The Weber Q1000 does not come with a temperature gage. So, I bought one and will install it myself when it arrives. It's really easy to install the gage. Just drill a hole in the cover, and hold the gage in place with a wing nut. Now I am able to invite my friends, John and Mimi, to a park party and I will prepare the food that we will eat myself! I've eaten at John & Mimi's home many times since I met them in 2003. I never invited them over to eat, until now! Weber and his friend, Hand Truck! My intention when I made a reservation at PF Chang's, was to do some blog post during lunch. When I was seated at a table and opened my backpack, the MacBook wasn't there. I had forgotten it. But I had my iPhone! I had attempted blogging on the iPhone before. However, I did not remember how that went for me. After spending about an hour trying to blog, I put the phone away. Blogging on a screen that is as small as my iPhone, is an exercise in futility! If you are able to do it, I am in awe of your skills. 5pm - "In Search of Israeli Cuisine"
"In Search of Israeli Cuisine"
A Temple Emanu-El friend sent me a blurb about this movie. It looked good. So, I bought a ticket. If you like to view a trailer, click [here]. The title of the movie is kind of an inside joke. Israel is not known for making good food. At least that was the case during Israel's first 30 years. When I returned to Guava Gardens, I saw a group of my lady friend/tenants out at poolside talking. I went over to the group, and sat down. We talked about my going hot tubbing every evening. And I invited them to go tubbing with me. None of them came. Hmmmmm? PS: I've invited other ladies to the hot tub. Ladies who don't live at Guava Gardens. They didn't come either. The last one told me, "I'm not ready for hot tubbing yet." Double Hmmmmm with sugar on it! I have the webber 1200, and it will get to 500 degrees, so you should be fine! Nice grill! I bought a thermometer that I will install in the cover. Your 1200 unit came with a thermometer. Mine didn't. That looks like a great setup..Weber is a reliable brand. and..You can put a small cooler on the same hand truck....good choice. The flowers that grow in my balcony garden are shade tolerant. I have a couple of grow lights on the balcony. I've just bought 15 tiny red clay pots. My thinking is to grow veggies from seed and start those seeds in the tiny red clay pots. Well, the friends are very cute. I hope they have good time with each other. Hilarious!!!....... "Double Hmmmmm with sugar on it!"